June 12- The day we attained freedom will always be a chapter worth remembering for each and every Filipinos. And as much as it is observed nationwide, SM Bulacan Malls prepared an exciting yet meaningful line of events to pay tribute to our land’s well fought Independence. 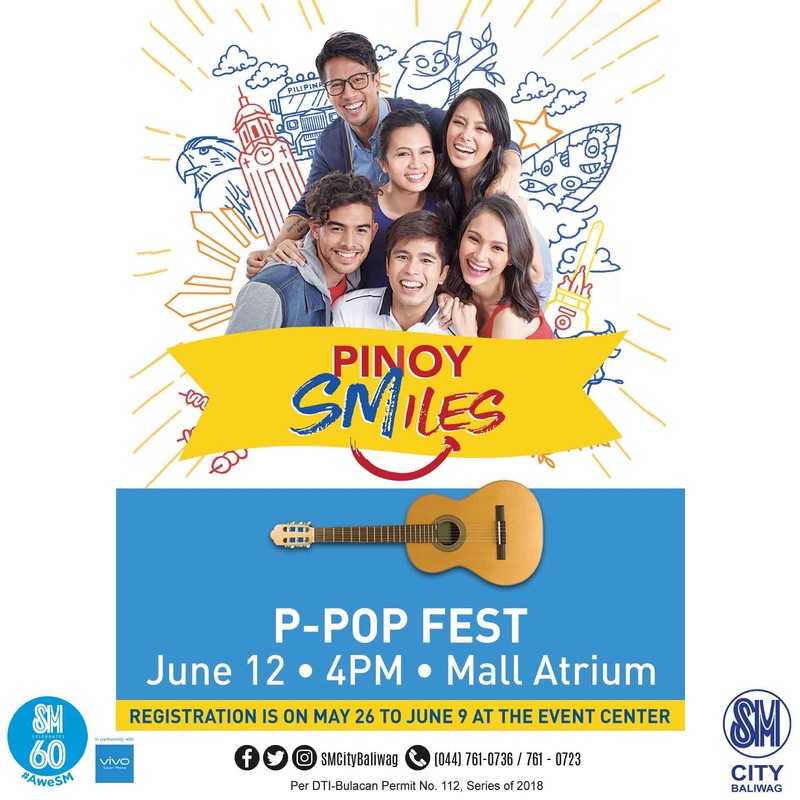 Bulakeños will sing a new hymn of freedom this June 12 as SM City Baliwag and SM City Marilao celebrates Original Filipino Music with its P-Pop Fest happening at the Mall Atrium. Homegrown artist Terence and Marguax will belt out best of OPM songs while in SM City Baliwag, the search is on for the most talented Bulakenyo. Calling all musically inclined individuals with a Pinoy heart, SM City Baliwag is holding the contest open to all participants. With a performance relevant to Independence Day theme, interested folks may sing any song in Filipino may it be acapella, with minus one or with instrument as accompaniment. Joining is easy! Participants need to present Php 1,500.00 single or accumulated receipt purchase from May 26 to June 9, 2018, from any SM City Baliwag tenants/ establishments. Registration is ongoing until June 9, 2018 up to 12noon only. To better express their nationalistic pieces, performers will be given a maximum time of 5 minutes to serenade the audience. An exciting array of prizes await winning acts for as much as P10, 000 worth of SM GCs for the first place, P7, 000 worth of SM GCs for the second place and P5,000 worth of SM GCs for the third place. For complete details on contest mechanics you may contact SM City Baliwag at (044) 761-0736/ 761-0723. Also like and follow SMCityBaliwag on Facebook, Twitter and Instagram for event and promo updates. Mall goers will also be able to get revolutionary discounts on great items during SM City Baliwag and SM City Marilao’s Pinoy Smile Sale. Celebrate your freedom to shop and get as much as 70% off on great finds this June 12. A special discount on Pinoy food are likewise offered to shoppers on June 1-12 with the Eats Pinoy! SM Malls in San Jose Del Monte, Marilao, Baliwag and Pulilan will also celebrate Philippine Independence by holding a simultaneous flag raising on Tuesday. This event is an annual celebration participated by employees, tenants and shoppers of each malls as well as the communities in which SM serves. Apart from the simultaneous flag raising, a series of cultural show will follow to commemorate the 120th Philippine Independence. Festive and vibrant musical dance parade will be performed live by the First City Providential College Baliktanaw Performing Arts at SM City San Jose Del Monte. Exhibits, iconic and unique centerpieces will be unveiled at SM City Marilao and SM City Baliwag.